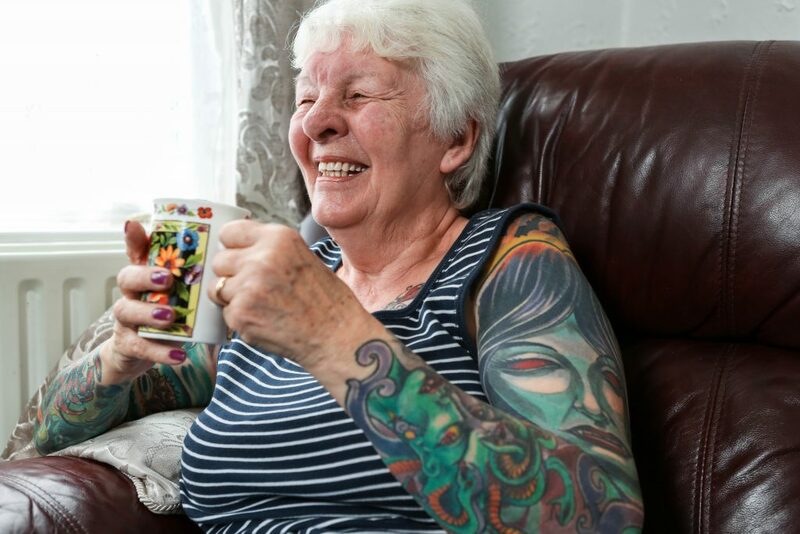 A rebellious 77-year-old great-grandmother has spent £2,000 on 16 tattoos covering her body since her husband died – including a tribute to him. 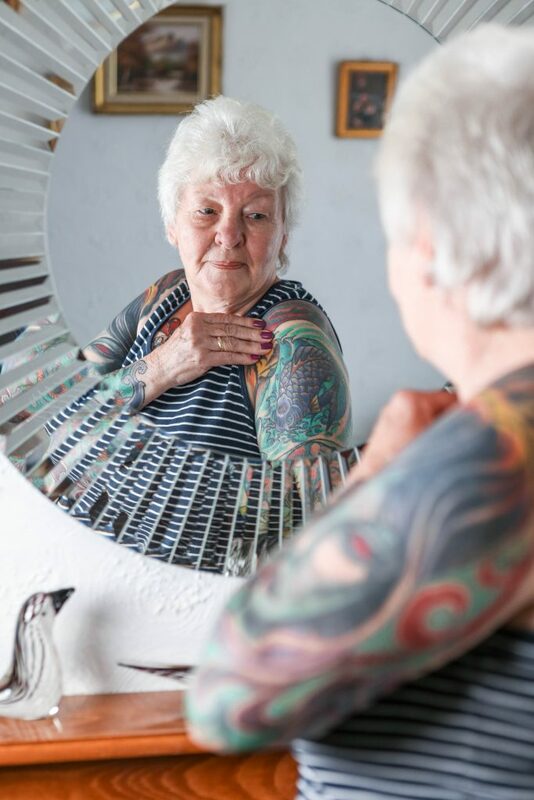 Glenys ‘the Menace’ Coope, 77, saves up the money from her pension so she can afford to get a new tattoo every few months. The widowed gran-of-five and great gran-of-three got her first set of tattoos back in the 1960s but later had them removed by plastic surgery because her husband Walter disapproved. But since his in 2014, the retired housewife and mum-of-two has begun to re-explore her love of body art and now has dozens of tattoos – including inkings of an alien vampire and Medusa – on her arms, chest and back. She said: “I’m not an ordinary old age pensioner. “I get one every couple of months. “I’ve spent £2,000 but it’s been worth every penny. “I save up because I’m a pensioner so when I’ve got enough money I go and get one done. 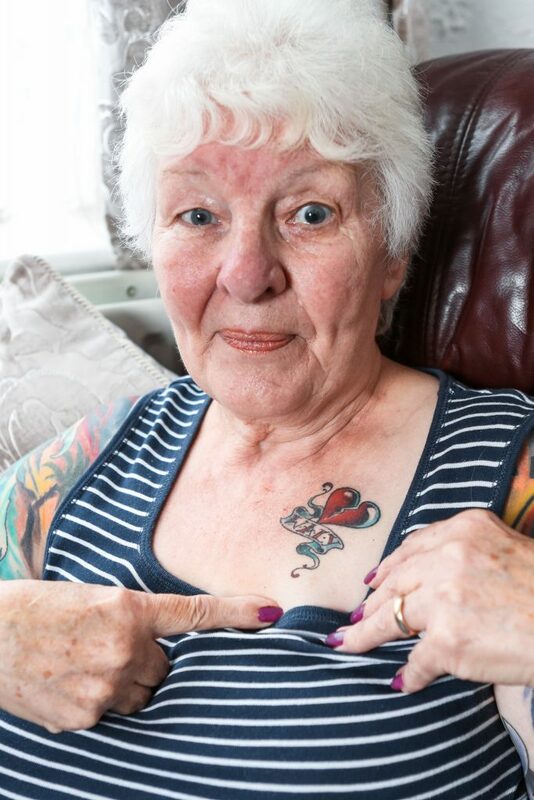 Glenys got her first of tattoos – two hearts on her neck, a beauty spot on her face, two swallows on her hands and a devil and rose on her back – in 1964. But she said husband Walter didn’t like them, so she underwent plastic surgery to remove them in 1985. The couple were married for 54 years before Walter passed away in 2014. 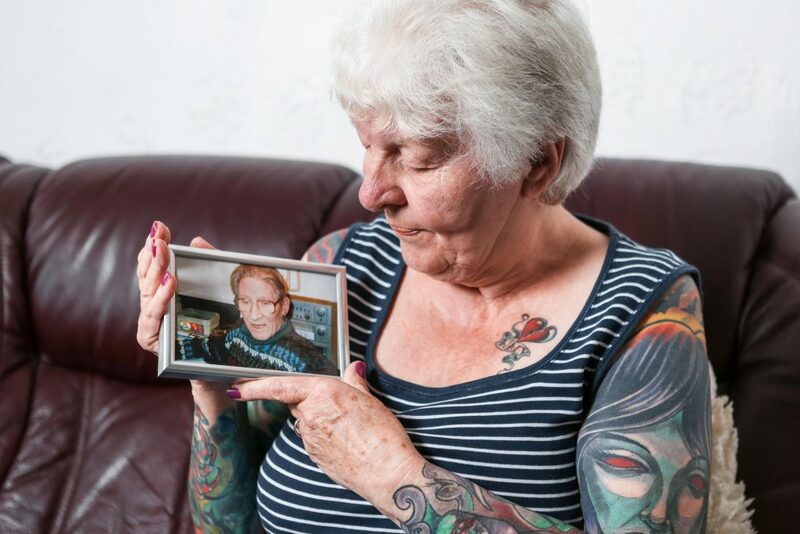 It was soon after that Glenys decided to get a tattoo to cope with her grief, and she now has a love heart with his name tattooed on her chest. Glenys said: “After he died I felt that this was something I wanted to do for myself. “People don’t say anything. They just look at me. “The occasional person doesn’t like them but everybody else is fine. People stop in town and want to take photos of them. Glenys visits a local tattoo parlour in Derby, Octopus Tattoo Studio, run by artist Gerry Carnelly, to have all her inkings done. 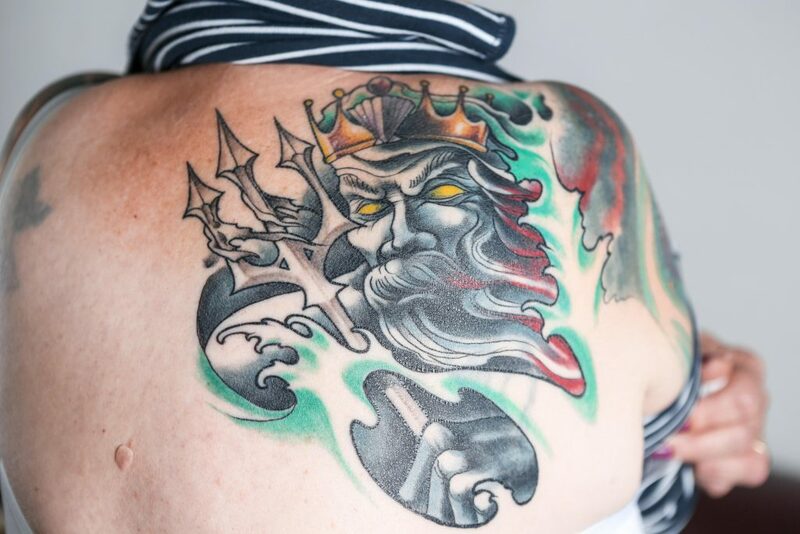 Glenys says that she’d encourage any older person considering getting a tattoo to have one. And she said her grandchildren and great-grandchildren love the designs covering her body. She said: “I’d tell anyone thinking about getting one to go ahead and get one. It doesn’t matter what other people think. “I’m proud of them and I like them. They’re very nice. My tattooist Gerry is very friendly and they’re a lovely lot at the tattoo parlour. “I’m always looking at people who’ve got tattoos. I find it fascinating. “My grandchildren and great-grandchildren think they’re alright, after all, it’s just a painting on the arms isn’t. “If I could get anything I think I’d have a forest with a werewolf on my leg and a werewolf on my other leg. “You name it, I’ll do it. According to Glenys’s sister, Pearl, her sister is tough and no-nonsense. And Pearl, 84, was been inspired to get her own inking of a bee on her leg two years ago after watching Glenys’ love affair with inkings develop. She said: “She’s always been a menace. “Not to me though, I love her to bits. “I love her tattoos. I’ve got one little one because I’m not as brave as she is.